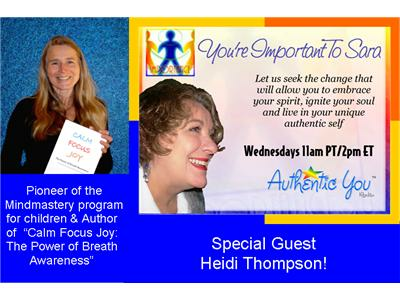 Special guest Heidi Thompson is live on air with host Sara Towe to discuss the topic of how breathing can heal and calm you. Artist and teacher Heidi Thompson lives in Coldstream, British Columbia in western Canada. She is the author of a new book: Calm Focus Joy: The Power of Breath Awareness - A Practical Guide for Adults and Children. Heidi has been practicing breath awareness for more than thirty years. In 1996, she pioneered an attention development program for children called Mindmastery and was one of the first to teach breath awareness in public schools. Visit the official show page of You're Important To Sara: www.AuthenticYouRadio.com/Youre-Important-To-Sara.